Earn $2.42 in Rewards credit (242 points) What's This? Tear up the muck with this wet weather weapon in your quiver, providing you an unfair advantage once things get wet. Featuring a tread pattern that cuts through the mud, ride with confidence regardless of whether you're riding in dust or mud. Whether today calls for a soupy gravel grind or a muddy 'cross race, the Terreno Wet Gravel Tire is ready to shred. Wet condition tread pattern features fast rolling alternating center ridges and full tread siping. I like 'em. They're a good value. I run 'em with a low PSI, tubeless and with confidence on...wet gravel! They are plush and comfy yet, at 33mm, give me just enough clearance on my CX frame. Are they fast? I have no clue. I ride with a self preservation mindset 100% of the time. Hence a sticky wet gravel compound on my bike so I don't kill myself out there, or find myself picking tiny gravel pieces out of a bloody shin. 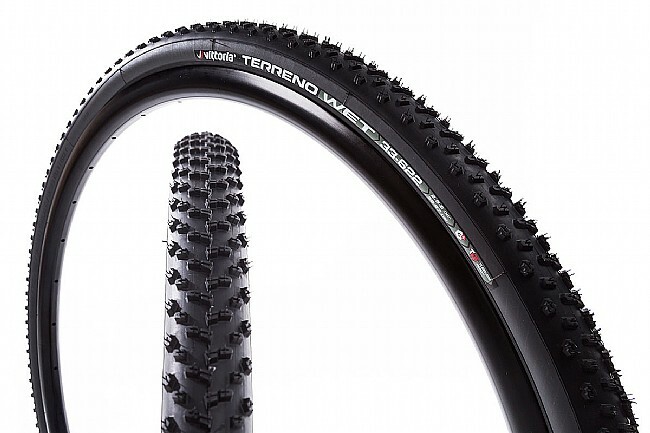 The Terrank Wet is a fantastic CX tire. I have used it as a front tire for mixed conditions (with a Terrano Mix in the rear) and I have been very pleased. I run it at 32 psi (I weight about 155) and it is very confidence inspiring.